“Is it really possible for Kafka on the Shore to be a play?” someone asked on Lincoln Center Festival’s Facebook page. The answer is “Yes,” but not without it’s problems. July ended with four performances at Lincoln Center Festival of Kafka on the Shore, Frank Galati’s adaptation of the Haruki Murakami novel of the same name. It wasn’t perfect, but it wasn’t terrible. Since I like focusing on the positive whenever I review anything Japanese-related, here are my Top 5 Most Delightful Things about Kafka on the Shore. Kafka on the Shore Nino Furuhata (left) and Rie Miyazawa. Photo by Lincoln Center Festival. The prolific Japanese theater director known for staging Shakespeare and Greek tragedies returned to Lincoln Center Festival for the third time, following the success of Modern Noh Plays in 2005 and Musashi in 2010. Actually, Ninagawa himself wasn’t in New York due to poor health, but his presence was felt and his spirit was a part of every detail in his elaborate production of Kafka on the Shore. Inspired years ago by the dioramas at the American Museum of Natural History in New York, Ninagawa, who turns 80 on October 15, used this concept to perfection in the staging of Murakami’s novel (more on the sets later). Yes, the Colonel Sanders, although this one was a pimp masquerading as the fast food icon. Masakatsu Toriyama bore such an incredible likeness to the patriarch of the fried chicken franchise that he made it seem believable that Colonel Sanders could actually be a panderer. Well, in Haruki Murakami’s world, at least. I couldn’t help but picture him standing outside the KFCs in Japan. Selling chicken, not anything else. Japanese actor Katsumi Kiba was perfect for the role of Nakata, a frumpy, kindhearted old man who was rendered a simpleton when he suffered from a strange accident while on an elementary school outing to pick mushrooms. Having never fully recovered, Nakata receives a “sub city” from the Japanese government since he is jobless and can neither read nor write. He may be lacking in intelligence, but Nakata can sense otherworldly events – such as raining fish – and has a special power to communicate with animals, which allows him to earn extra money by finding people’s lost cats. His love of cats also factors in his decision to murder a cat-killer who goes by the moniker Johnnie Walker (Masato Shinkawa) and also dresses like the Scotch whisky mascot. The funniest scene in the play comes when Nakata tries to turn himself in for stabbing Johnnie Walker to death. Nakata tells the truth with his matter-of-fact delivery, but the story is so unbelievable that the policeman sends him on his way. And his way is toward Shikoku and to more surreal adventures, which were more entertaining in the first act than in the second. Katsumi Kiba (far right) as Nakata with Katrine Mutsukiko Doi Vincent (center) and Mame Yamada in Kafka on the Shore. Picture from Lincoln Center’s tumblr. 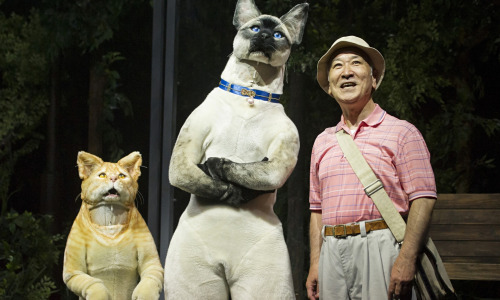 The human-sized cats with whom Nakata communicates are gorgeous and realistically cat-like thanks to flexible actors and to costume designer Ayako Maeda. Old black cat Otsuka (Yukio Tsukamoto), elegant Siamese Mimi (Katrine Mutsukiko Doi Vincent), and slightly dumb orange tabby Kawamura (Mame Yamada) are instrumental in helping Nakata find Goma, a missing calico, and leading him to Johnnie Walker. Phenomenal. As mentioned in #5, Ninagawa wanted to incorporate dioramas into the physical landscape with Murakami’s text. 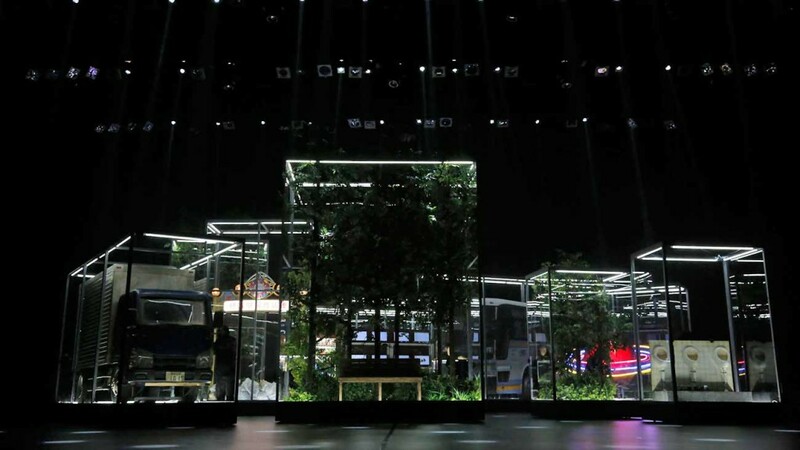 The giant Plexiglas boxes containing actors and set pieces faithfully recreating Japanese buses, bus stops with vending machines rooms, a truck, a library, a brothel, and a woodsy area glided effortlessly under the physical labor of kuroko, traditional stagehands in Japanese theatre. Kuroko dress in black and move silently since they are supposed to be invisible, essentially blending into the scenery that they’re moving. But in Kafka on the Shore, it was hard to ignore the integral part they played in the production, gracefully directing the dioramas in a strategically timed, well-choreographed dance. The beautiful and complex sets and the kuroko who moved them were the true stars of the show. Kafka on the Shore set. Photo by Lincoln Center Festival. Notice I didn’t mention the story itself. While I’ve never read Kafka on the Shore, I have read several of Murakami’s other works, so I’m aware of the multiple philosophical layers inherent in his story lines. Kafka screams Oedipal complex and Greek tragedy, which is the good part, probably because it’s the most straightforward. Fifteen-year-old Kafka, capably played by the talented young actor Nino Furuhata, runs away from home and his controlling father in Tokyo in search of his mother in Takamatsu, the scenic capital city of Kagawa Prefecture on the island of Shikoku. Kafka finds a safe haven in the town’s library and befriends the transgender librarian Oshima (Naohito Fujiki). The library is run by the morose and mysterious Miss Saeki (Japan Academy Award winner Rie Miyazawa), who is obviously Kafka’s mother. Even though Kafka suspects Miss Saeki is his mother, he sleeps with her anyway. He fulfills the Oedipal prophecy, but it doesn’t lead to a true conclusion, which is the main problem of this play. To the production’s credit the story wasn’t wrapped up with a tidy bow, but there were many unanswered questions. Was Johnnie Walker really Kafka’s father? Was Nakata really Kafka in a parallel universe? 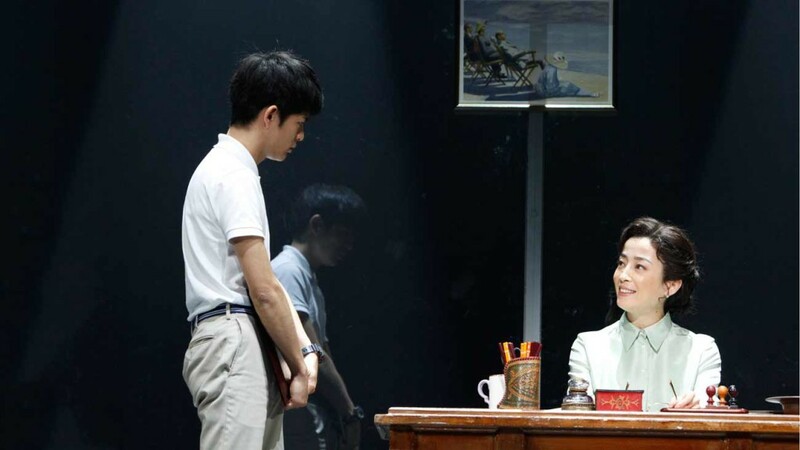 The staging of Kafka on the Shore was three hours, but that still wasn’t enough time to dive into the complexities of the story lines, the deep philosophical discussions, and the parallel stories of Kafka and Nakata that never intersected even though I kept anticipating it. Despite its shortcomings, it was visually stunning with delightful acting, which provided enough entertainment on a hot summer afternoon. Previous Previous post: Meet Dannie Compono, JapanCulture•NYC's Arts & Entertainment Editor!